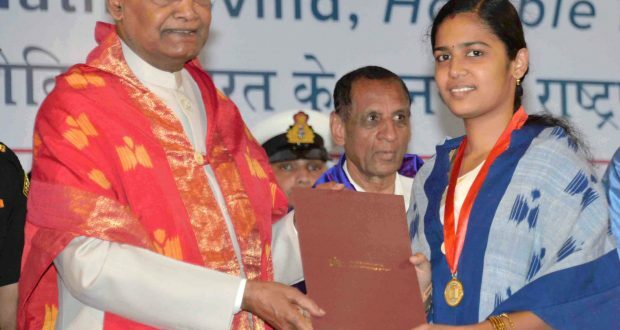 The President, Shri Ram Nath Kovind presenting the medal to a student, at the 7th Convocation of IIT Hyderabad, at Indian Institute of Technology Hyderabad, Sangareddy District, in Telangana on August 05, 2018. The Governor of Telangana, Shri E.S.L. Narasimhan is also seen. 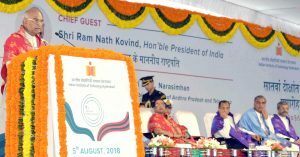 Hyderabad:5/8/18:The President of India, Shri Ram Nath Kovind, graced and addressed theseventh convocation of the Indian Institute of Technology (IIT) Hyderabad today (August 5, 2018) in Hyderabad. Speaking on the occasion, the President said that as a second generation IIT it is important that IIT Hyderabad borrow from as well as learn from the models of the past. Conditions are different from the 1950s and 1960s. India has changed. Technology and the very discipline of engineering have evolved. Our aspirations are no longer limited to the heavy industrial base that we created six decades ago. Rather, IIT Hyderabad has to remain relevant to the fourth industrial revolution that will write the script of the 21st century. He was happy to note that a start has been made by setting up a network of centres for research and promotion of entrepreneurship at this Institute.